It’s a conundrum of summer – just when the harvest is at it’s peak, with vegetables ripe and ready to be stewed and jellied, sauced and preserved, it’s too hot to turn the stove on. I have a solution. I make slow cooker tomato sauce, and I have a few tricks beyond using a crockpot to keep things cool and easy in the kitchen. The first thing to do is to turn the crockpot on high and pour in some good olive oil. Chop up some onion and toss it in. Let it cook while you’re dealing with the other vegetables. It doesn’t actually saute, but left in long enough (and in a newer pot that has a “high” setting,) you’ll get some browning and depth of flavor. You can make a classic tomato sauce, with just the onions and tomatoes, but at this point in the summer, I want to use up some squash and maybe a carrot or two. Hopefully, a bell pepper will be ripe. Dice these vegetables as uniformly as you can. Stir them into the onions and keep cooking. Don’t add any liquid, but you can pour in a bit more olive oil if needed. As much as I love homemade tomato sauce, I hate the task of peeling the tomatoes by blanching in boiling water. There’s all of that steam, and the ice baths to cool things, and the overall mess and heat of it. This year, I’ve discovered the soft vegetable peeler. I got it for the peaches, and it works beautifully on tomatoes! It’s got a serrated blade and peels quickly and without waste. I am in love. 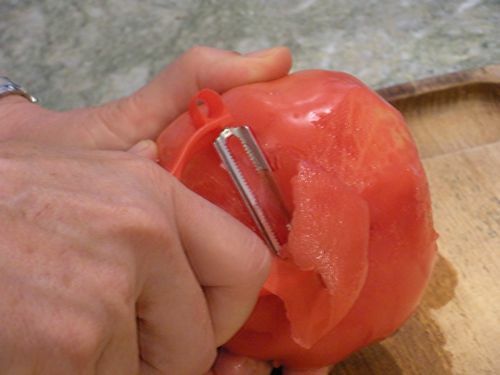 Coarsely chop the tomatoes. Set aside in a bowl. Go out to the garden and pick herbs. I have sage, oregano, basil and rosemary growing, which is a lovely combination for a sauce. Parsley is good, too. One of the reasons that people don’t bother with fresh herbs is the hassle of stripping the leaves from the tough stems and mincing. Well, in slow cooker, easy-peasey tomato sauce you don’t have to! Simply wash well and tie up with a string. 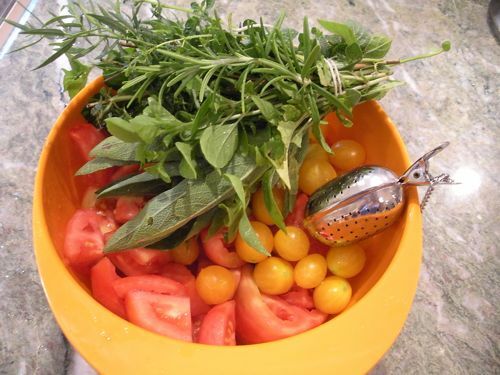 Here are the tomatoes (note that I’ve added unpeeled cherry tomatoes) and the herbs and a …. tea ball! I’ve put unpeeled garlic cloves into the tea ball. No mincing, no prep! 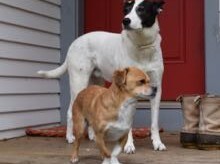 Since the sauce simmers in the pot for hours, I’ll get plenty of garlic flavor with NO WORK. Put everything in the slow cooker. Add a generous amount of good sea salt. Put the lid on, Reduce the temperature to low and leave it be for five or so hours. 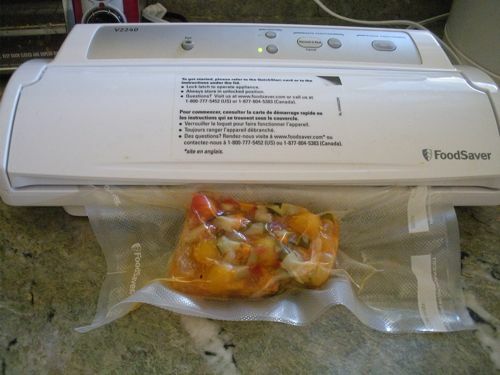 When it’s finished, I freeze in plastic containers.The next day, I pop them out, and repackage in my very favorite summer tool, the FoodSaver vacuum packer. Here I have a summer vegetable sauce, which this winter will find it’s way into a lasagna, or maybe pureed into a soup.